Tapping up my take on the Midland Game fair I'm disturbed by tum rumblings. There's no bread in the flat and I can't be arsed to walk to the shop. There is a rabbit I shot last night - but cooking that will take a couple of hours. Open the cupboards: 'Savoury Rice Cakes', a couple of months old - and ketchup. O.K. 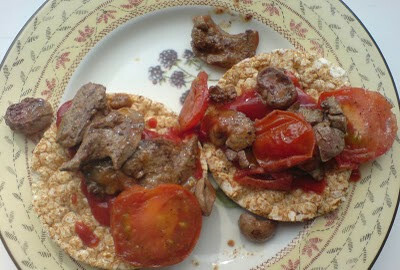 Fry the liver & kidneys in butter with a sliced tom, liberally coat rice cakes with ketchup, slap on the fried stuff & eat. Marvellous. Lick the plate clean. For pud, coat another rice cake with some home made damson & apple jelly I was given. Pretty damn good.